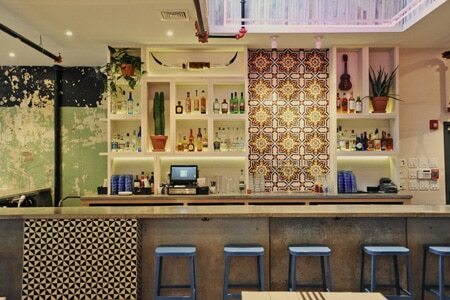 The after-work margarita bar gets a needed update at Sam Mink’s new-school Mission. : The party starts here: the team behind Sansom Street Oyster House goes upstairs for its foray into Mexican cooking with a modern, lighthearted sensibility. The airy, neon-festooned space is anchored by a bar and open kitchen, while a foosball table keeps diners occupied until their meal is served. The menu follows the same basic template seen in any traditional taqueria, with salsas and ceviches followed by tacos. Yet the cooking veers away from the expected with an addictively creamy coconut hazelnut salsa, a romaine salad with sunflower buttermilk dressing, and tacos layered with chorizo and potato purée. Luscious goat tacos with feta cheese and currants show just how enticing the cross-pollination of cultural flavors can be. A small lineup of desserts includes a daily soft serve selection and coconut tres leches. Of course, the crowds are here to unwind, and the beverage list dwarfs the food menu, with inventive cocktails like the Corn Star (corn milk, Jamaican rum); draft wines and beers; fresh juices and agua frescas for the teetotalers. There are margaritas as well, of both the frozen (cucumber serrano) and non-frozen (guava, tamarind) varieties.